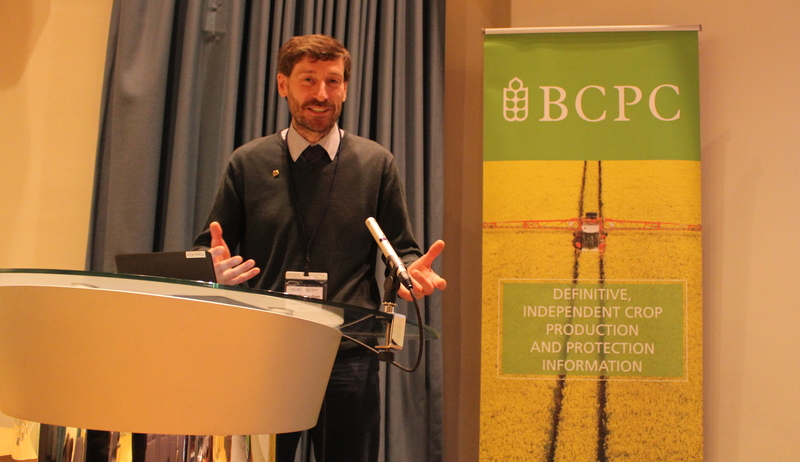 BCPC Weeds Review 2018 - BCPC British Crop Production Council : BCPC British Crop Production Council . The 2018 BCPC Weeds Review took place on Wednesday 7 November 2018 at Rothamsted Research. Abstract: A generalised view of the basic life cycle of annual weed species is discussed in relation to their fecundity, dispersal, predation and incorporation into the soil seedbank. The soil seedbank is considered in relation to size, distribution and persistence, seed dormancy and mechanisms regulating periodicity of germination through cyclic changes in dormancy and subsequent seedling emergence. The effect of maternal environment, positional factors and somatic polymorphism on seed dormancy and germination requirements are presented for selected species of grass and broad-leaved weeds. Abstract: The challenge we face on farm as direct result of herbicide resistance is increasing. It is well accepted that fully integrated strategies are required to manage the problem and that often significant changes to rotations and cultivation policy are needed. All of the available approaches being employed on farm today have the same common aim and that is to try and reduce the amount of viable seed being returned that will potentially cause an issue in the following crop. Harvest weed seed control (HWSC) exploits the high proportions of seeds retained at maturity by some weed species. The approach pioneered in Australia, as a result of increasing concerns over managing resistant ryegrass populations, works on the theory that 95% of the weed seeds that enter the combine header end up in the chaff fraction discharged at the rear of the machine. Using approaches to manage the chaff, rather than spreading it ahead of next season’s crop clearly could have value on UK farms, particular where black-grass, ryegrass and brome are an issue. A range of approaches have been trialled and are used commercially on farm in Australia, including chaff carts, direct baling, weed seed destruction and chaff tramlining. For the purposes of the UK trials we have focused on chaff tramlining given the low capital outlay, running cost and horse power requirements of the chaff deck. Three clear objectives were set at the start of the project, 1) to investigate the relative amount of black-grass seed retained at harvest, 2) to establish whether the chaff deck would work in a range of UK crops and 3) to see what proportion of the weed seed fraction we could consolidate into the chaff tramlines. After two years of trials, initial results are encouraging. The amount of black-grass retained varies depending on harvest date. Data confirm that weed seeds are being effectively consolidated, such that over the course of a rotation and provided the soil seedbank is left undisturbed we should start to see fields being “cleaned up”. Working on 5 farms for harvest 2018, the chaff deck has performed well in a range of combinable with the straw either left in the swath or chopped. Paul joined the Soil Survey and Land Research Centre (part of Cranfield University) in the early 1990’s to run their soil physics laboratory. Research interests focused on soil hydrology as well as the fate and behaviour of pesticide in the environment. His PhD looked the potential for Biobeds to be used on farm to mitigate the point source risk from handling plant protection products on farm. He moved to ADAS in 2005 as Principal Consultant, much of time focused on metaldehyde stewardship. Joined Adama, formally Makhteshim Agan as technical manager in 2009 and for the last three years been with Frontier Agriculture focusing on supporting our network of agronomists as well developing integrated crop production systems. Amenity perspective – Japanese knotweed; Ecology and Evidence – Daniel Jones, Advanced Invasives. Abstract: Japanese knotweed is the most notorious invasive non-native plant in Britain. Knotweed and its close relatives impose serious management costs on homeowners, developers and large landowners alike. Dr Dan Jones (Managing Director, Advanced Invasives) will discuss his research on knotweed rhizome ecophysiology, exploring how this is integral to effective knotweed control and the sustainable management of other rhizome-forming species. Dan Jones is an Honorary Researcher at Swansea University with over ten years experience across the ecological sector. He founded Advanced Invasives to bring fresh, evidence-led thinking to the industry and bridge the gap between applied research and the public understanding of invasive species. An expert in the sustainable control of invasive non-native plants, Dan also leads on best practice development. Abstract: With the increasing challenges of grassweed control, growers need to take advantage of every cultural and chemical option to keep population in check. A particular area which can be optimised includes the pre-emergent herbicide application timing. Syngenta has spent multiple years thoroughly researching the interaction of water volume, forward speeds, boom height & nozzles on herbicide efficacy. The results of which can be simplified into three key messages Go Low, Go Slow, Get Covered. This talk will be discuss in greater detail how this was reached. Clare Butler Ellis is the Research Manager of Silsoe Spray Applications Unit Ltd. She has worked in spray applications research since 1994 and has led the team since 2010. The Unit became an independent R&D business in January 2016, allowing it to continue the work it does for the agrochemical and agricultural engineering industries, as well as government, regulators and growers. The team remains located at Silsoe in Bedfordshire, UK, where they have a unique purpose-built facility and world-class expertise for research into pesticide application. Clare is a Fellow of the Institution of Agricultural Engineering and is a Chartered Environmentalist. Abstract: Why does identification of the five main weedy brome species matter? Different control measures apply to sterile and great compared with soft, meadow and rye brome in relation to post-harvest cultivations; label claims for control of different brome species vary, although there are also non-label claims; and emergence patterns and seed survival may vary between species and populations. Are spikelets wedgeshaped (sterile, great) or more ovalshaped (soft, meadow, rye)? If wedgedshape, are spikelets 40 – 60 mm (sterile) or 70 – 90 mm long (great) (including awns)? Is main stem of panicle hairless (sterile) or hairy (great)? If ovalshaped, are spikelets hairy (soft or rye) or hairless (meadow or rye)? Is white cross-section of ripe seed saucer (meadow or soft) or V or U shaped (rye)? Is the panicle compact (soft) or looser (meadow or rye)? Detailed 4-page and concise 2-page ID leaflets are available online on both the CROPROTECT (https://croprotect.com) and Weed Resistance Action Group (https://www.ahdb.org.uk/knowledge-library/wrag) websites. Stephen studied agriculture at (the late) Wye College, University of London, gaining a 2.1 BSc (Agriculture Honours) in 1972. After initially working as a nematologist, he moved into weed research in 1975, working at the Weed Research Organization near Oxford, then at Long Ashton Research Station near Bristol, where he gained my PhD and, from 1990, at Rothamsted Research. Stephen retired in 2015 and now undertaking private consultancy as Stephen Moss Consulting. His research included the agro-ecology of grass-weeds, factors affecting herbicide performance, herbicide resistance and integrated control strategies. He was Secretary of the UK Weed Resistance Action Group for 25 years. As well as publishing 240 research papers, book chapters and technical reports in my career, Stephen has contributed to over 350 articles in the popular farming press as well as given literally hundreds of talks, demonstrating the importance I attach to active knowledge transfer. It was largely due to this emphasis on knowledge transfer that he was awarded the Royal Agricultural Society of England’s Technology Award for 2009 and a BCPC award in 2014. Abstract: Members of the umbelliferae include edible plants such as carrot, celery, parsley, coriander, parsnips, poisonous plants such as hemlock, hemlock water dropwort and fool’s parsley. Currently unbellifers are trending in world of floral art and are prized for their open airy flowers and foliage. There are 73 species of umbellifers described in the BSBI handbook No 2 – Umbellifers of the British Isles, of which less than 10 are commonly found in arable fields. The aim of the presentation is to make identification easier for those in the field. Sarah Cook is a weed specialist with ADAS. She is interested in the identification of wild plants, their control in agricultural situations and encouraging them where improving biodiversity is needed.